Wool is a natural yarn, when used in your living space it provides heat, warmth and comfort. Wool is also very robust, it will influence your living space in both design and by adding a sense of wellbeing. 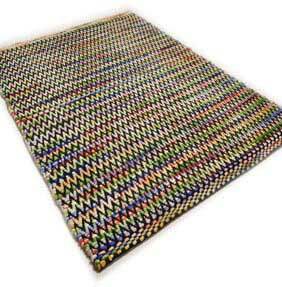 Modern Weave rugs are hand-woven from thick felted wool thread. This type of yarn is bulky in structure and firm but soft to touch. Each rug is put through a special dyeing process, the yarn is dyed unevenly and this creates the unique colour of these rugs. The weight per square metre is a massive 3600 grams.